Today I wanted to discuss PEACE in the midst of the storm. Many times in life we experience STORMS–bad relationships, bad jobs, loss of jobs, no money, lack of friends, and most importantly NO JOY. I come to tell you today that LIFE is going to happen, so it is IMPORTANT that you accept that every day will not be perfect. 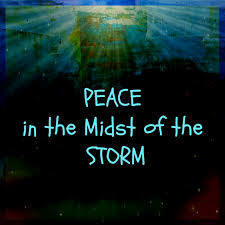 Here is what I have learned in the last 3 years, you MUST have PEACE in the midst of the Storm. The peace will keep you SANE. The peace will keep you in JOY. The peace will give you Hope when you feel despair. If you can always remember that nothing happens by ACCIDENT. It’s okay to experience STORMS but when you decide to have PEACE you life will be CHANGED.